With the throes of summer behind us, September brings autumn and the free fall slide into the chilly embrace of winter. As is the case with transition seasons, weather extremes are ripe for the picking. 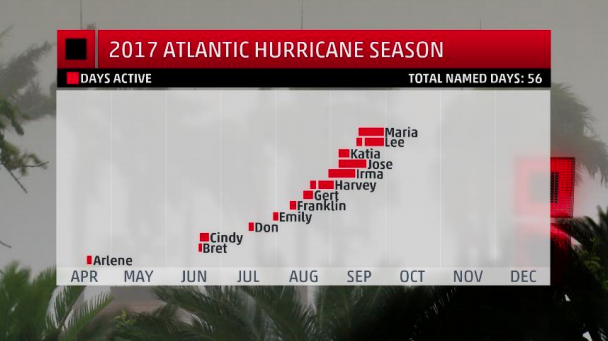 The Atlantic tropical season reaches its seasonal climax during the month, meaning any place from Maine to Texas is fair game for tropical activity. Severe weather ramps back up as strong cold fronts begin to clash with the remnant soupy, warm air masses of summer allowing large hail and tornadoes to return to the weather picture. Those very same cold fronts usher in the first tastes of winter as frosts and freezes begin to show up in the early morning hours. September is also typically the first month we begin to see accumulating snow reach the ground here in the lower 48. And yeah, out ahead of those chilly air masses can be some pretty doggone warm conditions that will make you wish for a colder day or two. So, did this September live up to its transitional nature? Let’s find out! In a place known for its cold, harsh, and snowy winters, Bangor, Maine felt about as far away from the winter chill as ever this September. 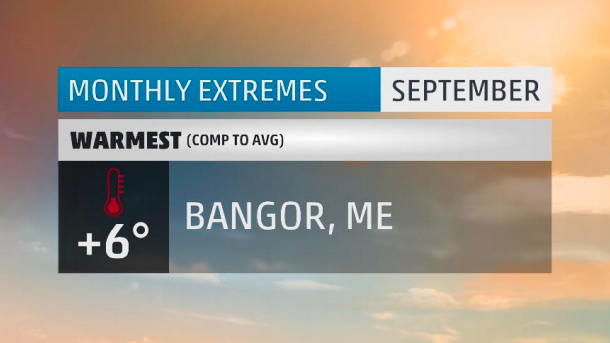 At just over 6 degrees above average, Bangor experienced its 5th warmest September on record. Typically, high temperatures during September fall from 75 to 64 degrees in the Queen City of Maine. This month, 16 days were above the 75 degree mark. Of those, 11 climbed in the 80s! As for the rest, a whopping 23 days of the month were above average. Two days managed to come in at over 20 degrees above average; that’s about as warm as you’ll get anywhere at any time of the year. Five record highs were set, including two at 89 degrees – enough to make it into the top 50 warmest September days on record. Assuming the mercury doesn’t hit 89 or better by the end of the year, that will make for the fourth latest temperature of that magnitude. By the final day of the month, temperatures did dip into the mid-30s, allowing for the first frost of the season to occur. That’s the third latest frost for Bangor since 1926. As for freezes, Bangor has made it to, or below, the freezing mark in about one-third of its Septembers. This September will make for the 56th September without a freezing temperature. The bulk of the widespread heat shifted from the West to the East during September as areas from the Great Lakes to New England had a warm and dry September. Concord, Islip, New York, Bridgeport, Providence, Portland, Allentown, and Rochester all had one of their top ten warmest Septembers. 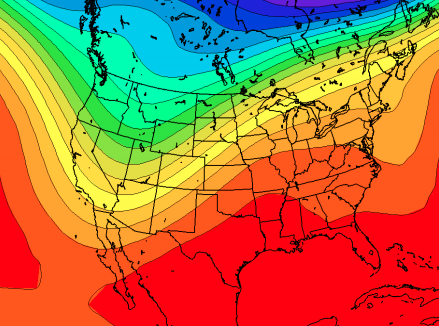 The back half of the month was particularly brutal as a large ridge engulfed the entire eastern half of the US. This led to widespread stretches of 80 and 90 degree weather east of the Mississippi. All states there, with the exception of Rhode Island, hit 90 degrees or higher at least once. 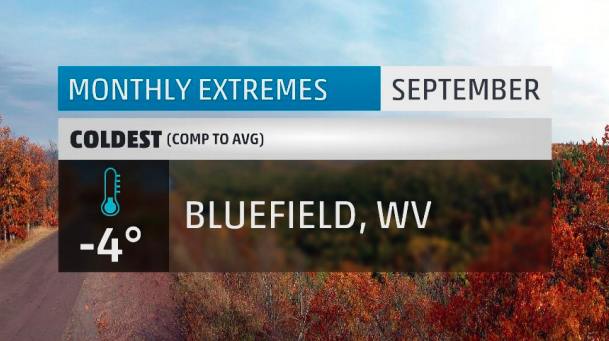 Of the handful of spots to see cool weather this September, the king of cool was Bluefield, West Virginia. Located about half a mile up in elevation among the Appalachian mountain range, Bluefield has acquired the nickname of “Nature’s Air Conditioned City” for its remarkably temperate climate. This September, the town lived up to its moniker by having its coolest September in over a decade. While they didn’t see top 10 cold, they did muster up 19 days with below average temperatures. Of those, 12 failed to reach 70 degrees for a high. Note that their typical highs range from 79 to 70 degrees throughout the month. Meanwhile, morning lows were just as chilly as 7 days slipped into the 40s. In all, Bluefield would set 1 record low and 3 record cold highs for the month. The cold air for Bluefield arrived at the start of the month as a strong, early-season trough dug in over the northeast. Within the trough, temperatures failed to hit 70 degrees for a week straight as northerly winds pumped chilly air into the region. Even as temperatures rebounded by the end of the month, the early season cold snap was too much to overcome. Our wettest city this month, just as last month, is due in part to a landfalling hurricane. Hurricane Irma struck Florida during the second week of the month bringing damaging winds and torrential downpours to the Sunshine State. The brunt of the heaviest rain fell on Florida’s east coast where Ft. Pierce would pick up nearly two feet of rain in just three days. Numerous rainfall records were broken. 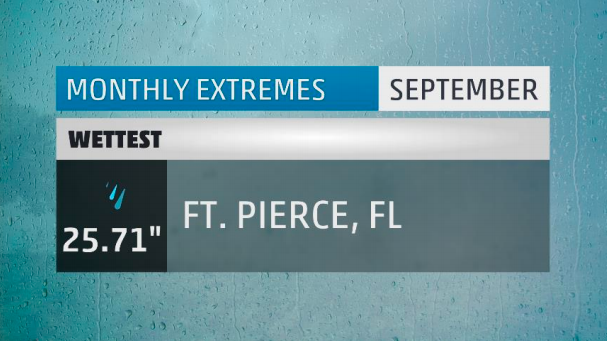 Ft. Pierce would set its first and second wettest September days on record, first and fifth wettest calendar days on record, wettest September on record, and wettest calendar month on record. The month in total had 13 days with rainfall. They would finish the month nearly 18 inches above average. And what a crazy month it was for tropical weather. Every single day of the month featured a named system of one kind or another. Of these storms, Irma and Maria would reach category 5 strength before making landfall in the Caribbean. Irma would make six category 5 landfalls during its journey to the US mainland, including stops in Barbuda, St. Martin, Cuba, and the Bahamas. Maria made landfall in Puerto Rico as a strong category 4 storm with winds of 155 MPH. The destruction seen on the island will take months, if not years, to erase. Aside from the record rainfall seen on Florida’s east coast, wet weather was also abundant along the Front Range of the Rockies. With a strong trough over the West during the latter half of the month, ample Pacific and Gulf moisture were drawn up and rung out along the lee side of the mountains. Abnormally dry weather was widespread from the Central Gulf through New England. 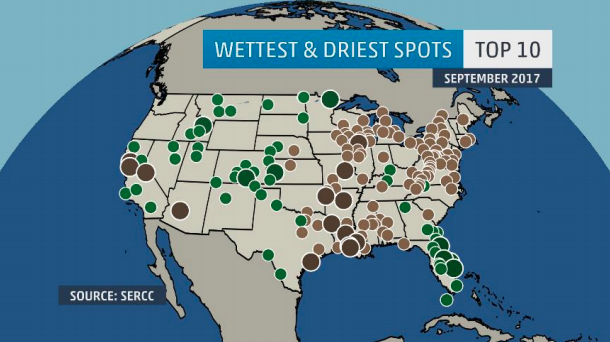 Some spots in the mid-Mississippi Valley didn’t see a drop of rain the entire month. Both Shreveport, LA and Fort Smith, AR had zero rain. Beaumont, which dealt with over 60 inches of rain in August, had only 4 days with rain in September totaling just 2.57 inches. Located in Nevada’s Great Basin is the small town of Ely. Of all 800 some official weather observation stations, Ely was the first and only spot in the lower 48 to see measurable snowfall this September. 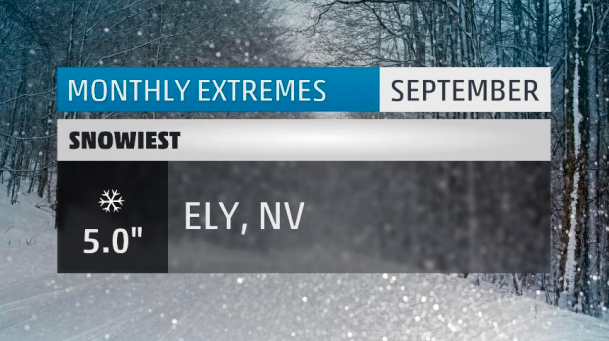 For Ely, this was their 2nd snowiest September on record. As for snowy Septembers, this was only Ely’s 11th since 1893. It was also the first September snow there since 1986. This was the earliest 4 inch or greater accumulation on record, and just one day shy of being the earliest inch of snow. On average, Ely see its first inch of snow on November 2nd. All 5 inches this month fell on one day. Just one day prior, the high temperature was a balmy 75 degrees. If that’s not a stark enough contrast, the month started with numerous 90 degree days! All this warmth did not make for picturesque powdery snow. In fact, the liquid equivalent of those 5 inches was a meager 0.78”. That’s a snow to liquid ratio of 6.4 to 1. On the skiing snow index it scores very poorly, however, on the snowball making index it gets the highest marks. Just north of downtown Phoenix, Arizona is the town of Deer Valley. This September, they made the top spot as our sunniest city in the US. All 30 days of the month were clear, with just three of those having enough cloud cover to barely make 10% average cloud cover for each day. And go figure, no clouds also meant no rain. 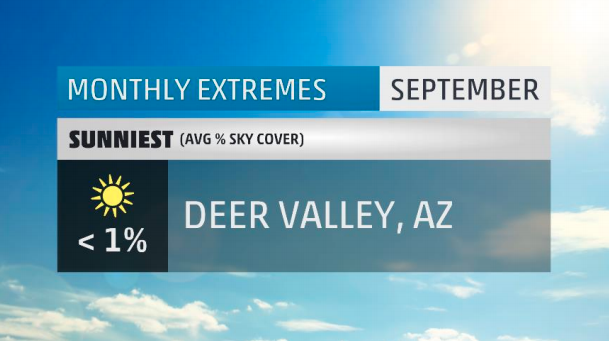 Even with all the sunshine, Deer Valley had their 3rd coolest September on record and set 6 record lows! Typically their sunniest month of the year is July. Meanwhile, whether they were under the gun from Hurricane Irma, or stuck with stalled out fronts and onshore flow, Miami could not escape the cloud cover. Twenty-eight of September’s 30 days were partly cloudy or worse. Eighteen of those days saw measurable rainfall. Even with the cloud cover, Miami finished with above average temperatures. 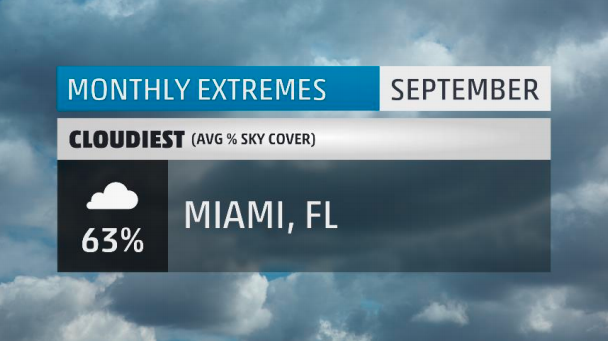 On the average, July and September are tied for Miami’s cloudiest time of the year. There you have it, the extremes for the month that was September 2017. Make sure to check back next month to see what October has in store. 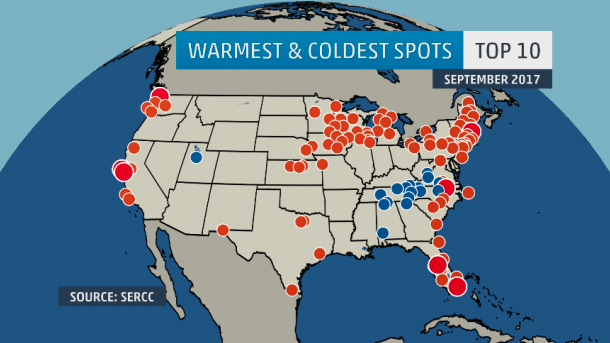 What weather extremes did you face in September? Let me know in the comments below.